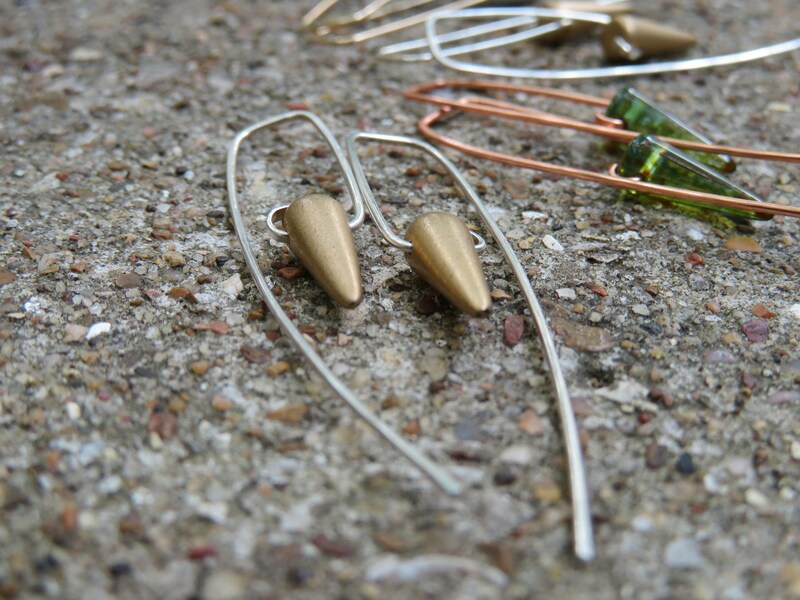 My En Pointe earrings have constantly been a best seller at craft shows. 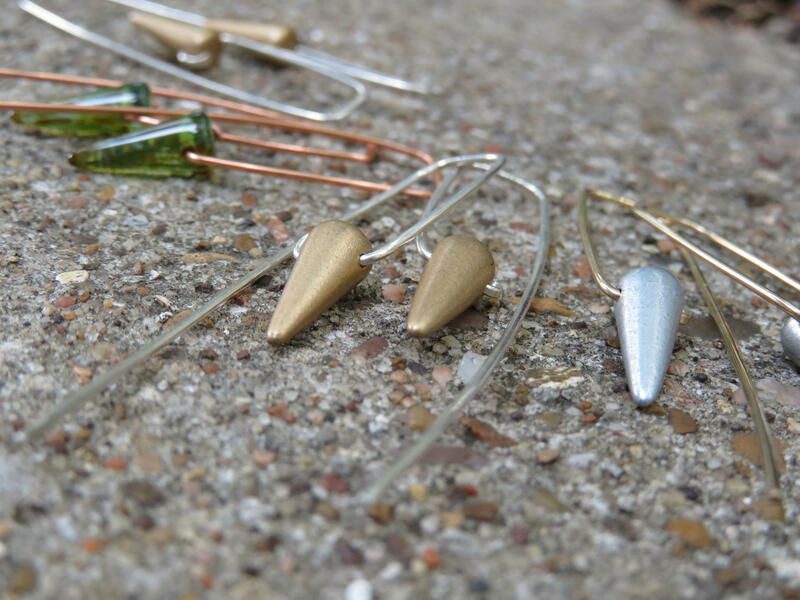 Inspired by the beautiful simplicity of the handmade Czech glass spike beads, I designed these long, curvy hammered wires to show them off. In addition to the original size and the much smaller En Pointe Petit, I've added this new medium size. 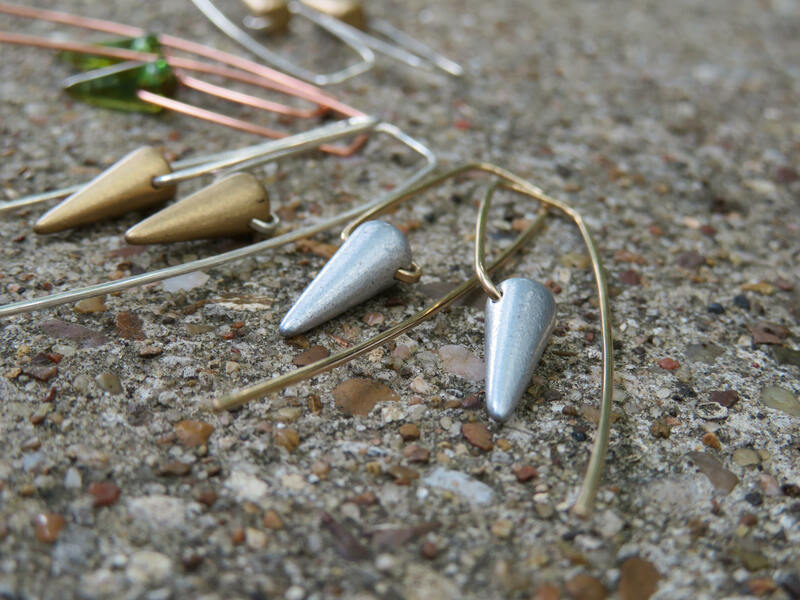 The spike beads measure approximately 1/2 inch long. 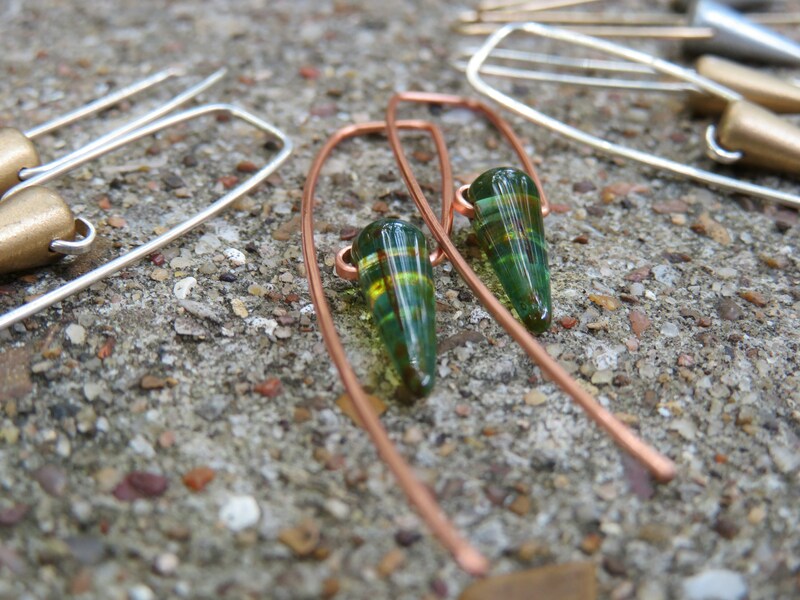 The overall length of the earrings is approximately 2 inches, although each pair is individually formed, so they may vary slightly. This item is currently available with a matte gold bead on a bright sterling wire, as highlighted in the first picture. The other colors shown in the pictures are not currently available. I will replenish out of stock colors when I can obtain them, but it is difficult to guarantee that I will be able to locate specific colors, so I have disabled the custom order option on this item. Thank you for understanding. Ready to ship for yourself or that special gift. All items shipped with insurance via Shipsurance at no additional charge. Payments can be made with Credit Card or PayPal through Etsy's Direct Checkout system. I reserve the right to ask for a deposit or full payment in advance on custom orders once we have agreed upon a price. This will cover my cost in materials and insure that you get the quality items you desire. Thank you for understanding. Shipping is free for all orders shipped via first class mail to destinations within the continental United States. Shipping upgrades are available at additional charge, as listed. Insurance is included on all shipments, regardless of type of service selected. Please note the estimated processing and shipping times listed for each item. For international shipments, I ship all items via Etsy calculated shipping, so you pay the actual shipping fee for your destination and type of service. Customs forms will be filled out specifying the type of merchandise being shipped. The customer is responsible for any duties or tariffs incurred for shipments to countries outside the United States. Please understand that neither Etsy nor I have any means of estimating, collecting, or submitting these fees to the destination country. If your purchase is a gift that you would like to have shipped to an address other than the one on your Etsy account, please make a note in the "message to seller"
Due to the delicate nature of my designs, they should be handled and stored with care. I will gladly repair any damaged items to the best of my ability, although in some cases I may not be able to exactly duplicate the original appearance. If you need to return an item for repair, please contact me to make arrangements (and I'll pay to ship it back to you!). Items lost in shipment will be refunded or replaced with similar merchandise, but may require extra time to recreate, depending on availability of materials.